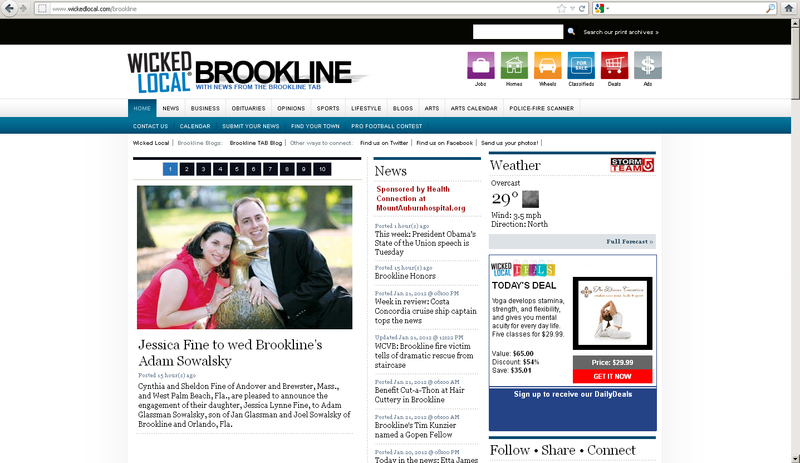 On the heels of my previous post comes the announcement that today we are the “HEADLINE” of the Brookline Tab & Bulletin website.Â Our engagement announcement was printed in their local paper, as well, and our announcement is currently the leading story on the webpage.Â To immortalize this moment, I created a screenshot. Surely, there are bigger stories.Â Then again, maybe not. What we failed to notice was the shout out on Twitter! The Brookline Tab doesn’t normally tweet about engagements but they did tweet about ours.